Cruise ship “Leo Tolstoy” has ended navigation for the year 2015. As in previous years, the ship navigated between Moscow and St. Petersburg making 10-day cruises. The majority of passengers are from abroad. The cruise ship has catered for foreign customers for quarter of a century by now. For the first ten years after its construction in 1979, ship operated as a floating sanatorium for the Ministry of Defense of USSR. During that time, its routes were far from ordinary; for example, it could go from Moscow to Taganrog or to Vyborg. The new era of Russian cruises has began with the beginning of perestroika. The opportunity of renting out the comfortable ships to the new joint ventures became a great support for the navigating organizations. Because, the Tourism Departments and Tourism Boards could not guarantee the stable load and financing for the ships. At those times, the route from Moscow to St. Petersburg has been opened for foreigners, which later became the main one. Before, during Soviet Union times, the only available route for tourists was from Kazan to Rostov-on-Don. The work with foreign customers during the 90s literally saved the cruise ship industry from collapse and allowed to keep the fleet and work spaces. 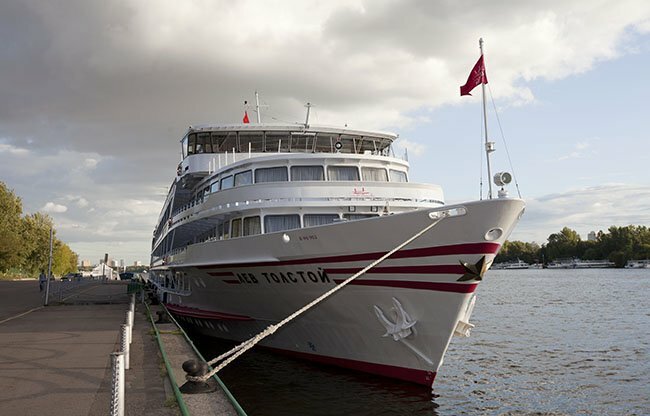 Cruises on “Leo Tolstoy” are multinational – here you can find people from all over the world, and some times Russian groups also join the voyage. For foreign tourists, the cruise lasts, in general, 10 days, and for Russian tourists – 7 days. The program for foreign visitors include the stay and excursions in the starting and en ding points of the cruise, in St. Petersburg and Moscow, that is why duration of the trip for them is longer. The cruise itself lasts 6 days, and excursions and stops are same for everyone on the ship. Catering and entertaining program are the same for foreign language and Russian language speaking groups, but each group has its own guide. The board team has 17 persons in total. Their duties are: organization of the entertaining program, assistance during the excursions on the shore, information support regarding the places along the route.